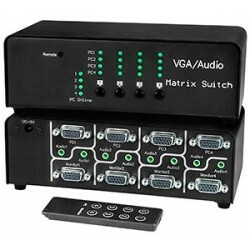 Switch VGA video & stereo audio from four computers among four monitors & speakers. 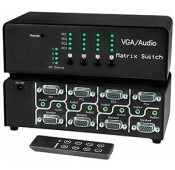 The MTX-4X4-15VA Audio/Video Matrix Switch routes audio and video signals from many computers to multiple displays (projectors, monitors, etc.) and speakers. Supports 1600x1024 video resolution at a refresh rate of 60 Hz. Cascade two switches to increase inputs and outputs. 110 or 240 VAC at 50 or 60 Hz via US AC adapter (included). 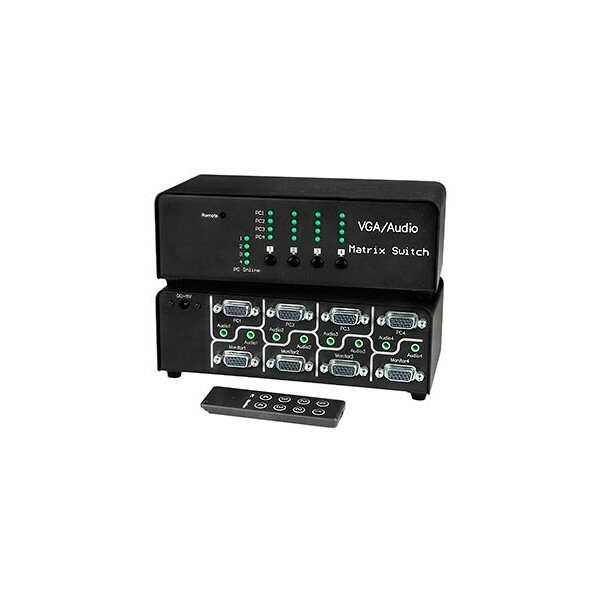 Optional universal power plug adapters available (not included). 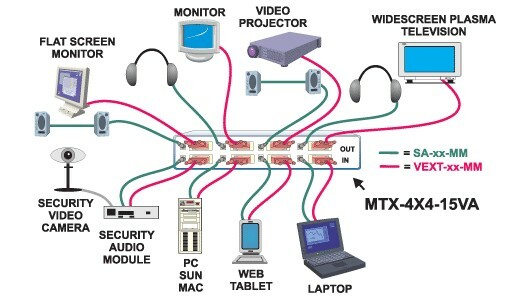 Connect or extend a VGA monitor up to 100 feet away. Convert any power plugs into SI 32 male. Convert any power plugs into SEV 1011 male. Convert any power plugs into Schuko CEE 7/7 male. Convert any power plugs into CEE 7/16 male. Convert any power plugs into CEI 23-50 male. Convert any power plugs into BS 546 Type M male. Convert any power plugs into BS 546 Type D male. Convert any power plugs into BS 1363 male. Convert any power plugs into AS 3112 male.